Jerusalem is off-limits to most West Bank Christians unless a special permit can be obtained. In fact, many of the Christian holy places, such as Nazareth and the Sea of Galilee — the locations of churches that commemorate the Annunciation, the Sermon on the Mount, and the Feeding of the 5,000 — fall inside the boundaries of the State of Israel. Tourists can come and go, but without special permits, West Bank Palestinians are not allowed to enter or travel freely inside Israel. In April 2016, we visited Bethlehem during the 2nd week of Eastern Lent. Bethlehem, located in the West Bank, is cut off from Jerusalem by a 25-foot concrete separation barrier (the Wall) that encircles the city. It appeared to us that the Church of the Nativity was unusually quiet in comparison with previous visits from 1995–2014, and our pilgrimage group comprised the greater part of the congregation at a mass we attended in the Franciscan grotto of St. Catherine. The streets of the city were eerily empty, and many stores and hotels appeared to be closed. Tourism has been a large part of the Bethlehem economy, but our group appeared to be the only customers in a shop selling locally made pottery and hand-carved olive wood. Graffiti on the Wall speaks to the frustration and yearning of the people forced to live their lives hemmed inside a virtual ghetto. Fred and I celebrated Easter on May 1, 2016, in the West Bank city of Ramallah, during our volunteer time. To preserve Christian unity, the Christian churches of Ramallah — Latin, Orthodox, Melkite, Lutheran, Anglican, Baptist, Coptic and others — now celebrate together at Christmas as dated by the Gregorian calendar (Latin Catholic rite and protestant churches) and at Easter, as dated by the Julian calendar (Orthodox churches). Following the ancient tradition in the Holy Land, Easter is celebrated at the Church of the Holy Sepulcher on the basis of both Eastern and Western calendars, but most Palestinians are unable to attend these services. The distance between Ramallah and Jerusalem is about eight miles. Unlike Bethlehem, Ramallah is not closed off from Jerusalem by a single great Wall, but by major checkpoints that restrict free travel at all times, including religious holidays. Since they cannot travel freely to Jerusalem, residents of Ramallah and nearby villages join in the celebrations of other religious traditions. No greater was Palestinian unity more apparent than at the Sabt al Nour parade on Saturday before Easter Sunday, when thousands of Christian and Muslim spectators lined the streets of downtown Ramallah to watch hundreds of Christian Scouts from 14 West Bank villages as they marched with colorful flags, drums, bugles and bagpipes in a joyful procession. For the first time in many years, Israel granted Orthodox Scouts from Gaza permission to travel to Ramallah. When we visited Jerusalem a few days after Easter, the usual bustle of clergy and nuns in their flowing vestments, pilgrims and shoppers was absent in the Christian Quarter of the Old City. 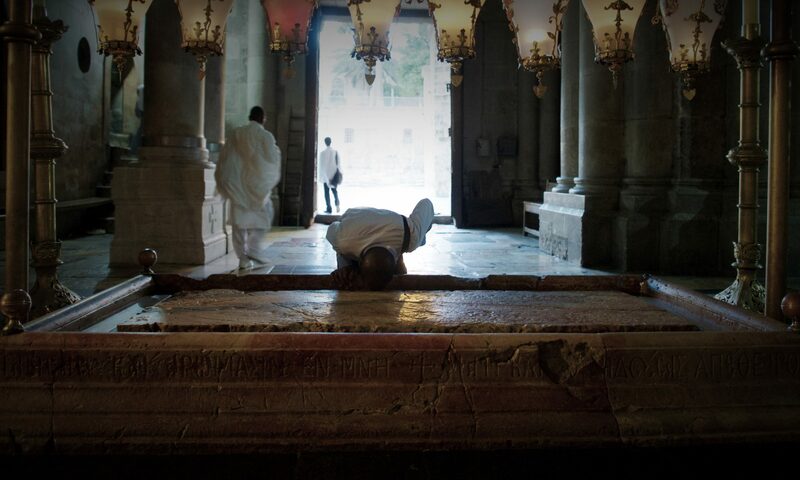 Queues of worshippers at the Church of the Holy Sepulcher were remarkably short; only a few knelt to touch the anointing stone or the rough rock of Golgotha, and the wait to enter the Edicule of the Tomb, revered as the site of the resurrection, was shorter than we can remember. Compared to our visit in 2014, the usual elbow-to-elbow crowds were smaller in the busy souk of the Muslim Quarter, and we were conscious of the increased presence of heavily armed young members of the Israeli Defense Force on the steps of the Damascus Gate entry to the Arab quarter of the Old City. Two years ago, many of the military, though armed, were in civilian clothes. Shopkeepers, especially those who count on sales of Christian souvenirs for their living, said sales were very slow, and many shops had been closed. Since 2014, the number of Christian worshippers, both local and international, has fallen off significantly in Jerusalem. The Guardian (3.16) reported that the number of pilgrims and visitors to the Old City of Jerusalem usually peaks at Easter, but in the last two years, those taking part in the Palm Sunday procession from the Mount of Olives to the Church of the Holy Sepulcher were estimated to be nearly 10,000 fewer than in 2015. Jamal Khader, rector of the Latin Patriarchate Seminary, attributed the fall in the number of pilgrims to a spike in violence, government warnings, and the heavy presence of Israeli soldiers, as well as the difficulties obtaining travel permits, but “the very idea of needing permits to go to pray in the holy sites is against freedom of religion,” he said (Catholic News Service, 3.16). According to Yusef Daher, secretary general of the Jerusalem Inter-Church Center, the permits issued by Israeli authorities are problematic. “Often permits are issued for only some members of the family — the wife, or the children,” he said. “Some permits are issued for dead people . . . even if people have permits, they often cannot travel because of closures due to military restrictions or Jewish holidays, when only emergency medical vehicles are allowed through the checkpoints” (The Guardian, 3.16). The Inter-Church Center works to strengthen local ecumenical and interfaith relations and hosts the Ecumenical Accompaniment Programme in Palestine and Israel (EAPPI). Established in 2002 by the World Council of Churches, this program marks 15 years of bringing volunteers to accompany people in Palestine as they navigate daily routines, often under duress. A network of police barriers that disrupt the flow and make it difficult to reach the holy sites are part of the current Israeli government’s policy of making Jerusalem an exclusively Jewish city, Daher told the Catholic News Service. According to Israeli officials, restrictions at the Holy Fire celebration at the Easter Vigil are needed to reduce the fire hazard, but these restrictions were not needed 10 years ago, he said. Daher went on to say that for the last two years, the Jewish Passover and Easter holidays have coincided and that Jews entering the Old City had complete freedom of movement, whereas special permits were required for Palestinians from the West Bank to enter Jerusalem. About 10,000 permits were issued to Palestinians wishing to worship in Jerusalem in 2016, but they often could not be used because of the unpredictable nature of Israeli restrictions in the occupied West Bank and East Jerusalem. Another kind of threat to religious practice has been increasing in both Palestine and Israel. In April 2016, we stood on the shore of the Sea of Galilee in front of the charred white limestone façade of the Church of the Multiplication of Loaves and Fishes (CMLF). Almost a year ago, restoration had just begun on this not-to-be-missed pilgrimage site. An arson attack by young Israeli extremists in June 2015, had caused extensive damage to the roof, entry way, an office, meeting room and souvenir shop. Bibles and prayer books had been burned, and Hebrew words spray painted on the wall in red that denounced the worship of “false gods,” reflected an extremist ideology espousing the belief that “only someone who fights Christianity . . . can call himself a Jew” (Reuters, 6.15 and The Telegraph, 7.15). The modern Church of the Multiplication of Loaves and Fishes, located near Capernaum in Tabgha, Israel, was built in 1984 on the remains of two earlier Byzantine churches (4th and 5th Century) to commemorate the multiplication of five barley loaves and two fishes in the feeding of the 5,000, one of the earliest miracles performed by Christ. Overseen by the Benedictine order, the fire was first discovered by a caretaker monk who woke to the flames in the middle of the night. He was injured but recovered, and fortunately, the 5th-Century mosaic tiles on the sanctuary floor were spared. The Israeli government reportedly contributed almost $400,000 toward a restoration project costing some $1 million (BBC News). The church reopened in February 2017. Unfortunately, the torching of the CMLF was not the first of the hate crimes against Christian and Muslim monuments, cemeteries and places of worship that seem to be growing in frequency and number in both Israel and the West Bank. The Telegraph reported that up to the June 18 arson attack, there had been more than 40 incidents in the West Bank and Israel since 2009 with only a “handful of indictments handed down,” and National Geographic reported that between the years of 2012 and 2015 alone, a dozen churches and monasteries had been burned, bombed or vandalized. As of writing, three Israelis had been indicted for the torching of the MFLF, but as yet had not been sentenced. (BBC News, 2.17).